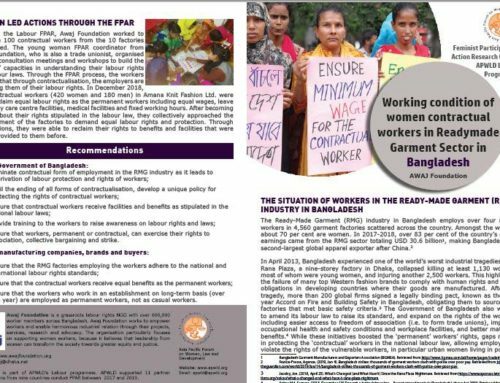 On 22 March, 2017, APWLD hosted a side event at the 61st Commission on the Status of Women (CSW) in New York, titled ‘Confronting Crises With Solidarity: Escalating Global Strikes.’ It followed two years after our Labour Programme focal person, Nazma Akter, president of the Sommilito Garments Shomik Federation in Bangladesh, called for a global strike while speaking at the People’s General Assembly. 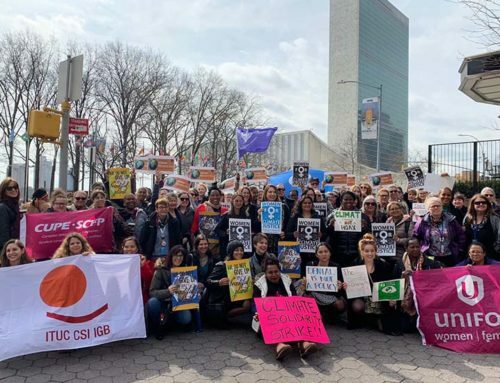 APWLD’s decision to work towards a global strike reflects our analysis that democratic systems are failing in our region, and that the strike is the instrument left for us to call for Development Justice. 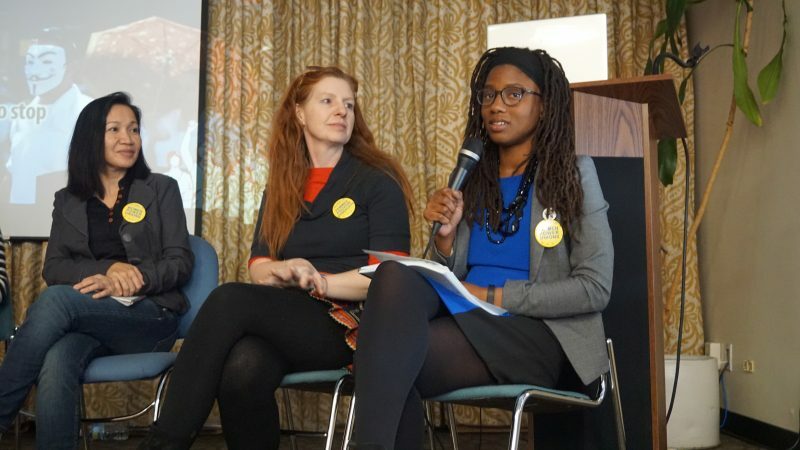 Our event was timely, against the backdrop of an increasingly repressive CSW where right-wing groups were gaining ground, and just two weeks after the global ‘Day Without a Woman’ strike marking International Women’s Day. 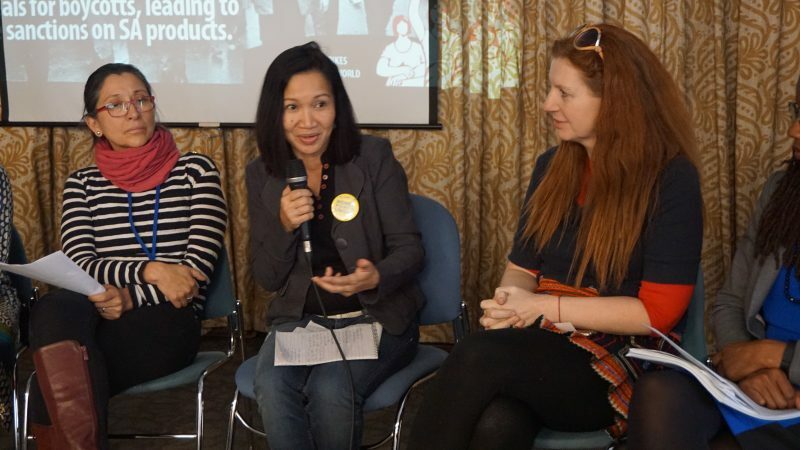 Our speakers included Nazma Akter and Daisy Arago, who are APWLD’s Labour Programme focal persons. Daisy is also executive director of the Centre for Trade Union and Human Rights (CTUHR). 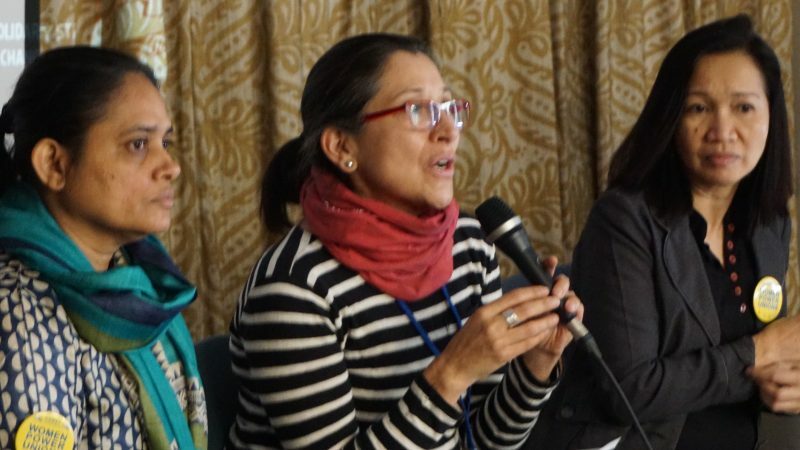 Guest speakers were Verónica Montúfar, gender equality officer project coordinator for Public Services International (PSI) and Paulina Davis, vice chair of the New York chapter of National Women’s Liberation (NWL). APWLD regional coordinator Kate Lappin facilitated and spoke about the history of strikes that have resulted in change, as captured in our history of strike slides. 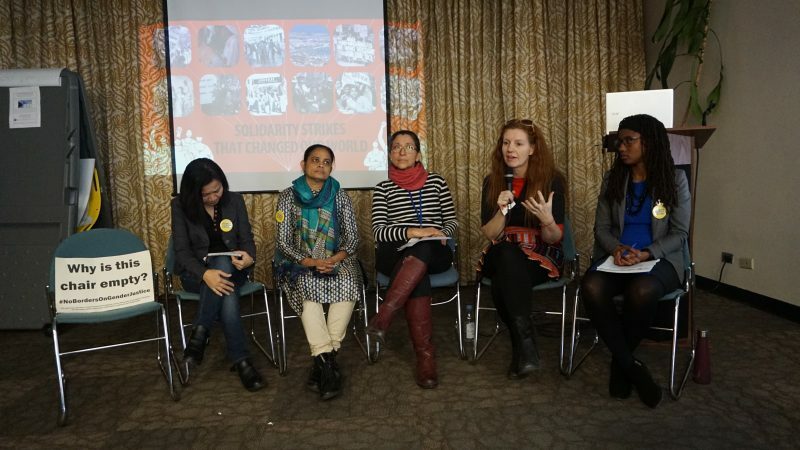 All five speakers shared their experiences in being part of protests, joining unions and realising that the injustices faced by workers around the world are shared injustices. 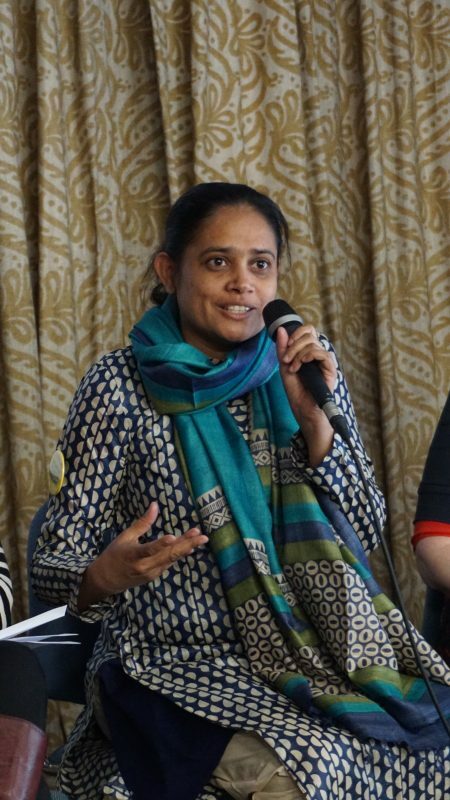 Daisy Arago spoke of her student activism and inspiration that she gained in witnessing protests on every issue, demanding freedom and democracy, against repression. She agreed that the strike was transformative and that it connects people. She said the power of the strike has been undermined and has been under attack. “The rights that we have now are a product of strikes, of protests. 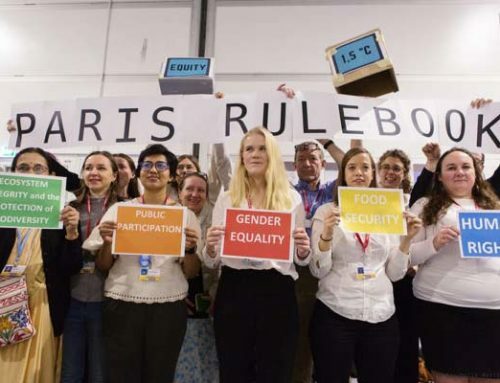 These negotiations are talking about very technical things, but never substantial ones.” Rather than looking at the way the corporations have taken over the power the state, she was saddened and angered to find the conversations at the UN were about strengthening the private sector, which already has so much power. 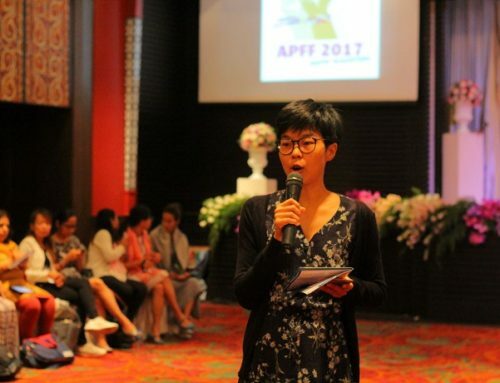 “We see in every country how corporations have been ripping apart our natural resources to pave the way for extractive mining, we see how they dry the underground water for agricultural plantations of oil palm, bananas, for export. And yet, when we protest, we meet with violence. Many of us have been killed for protesting that kind of influence, power being imposed on us.” She said that the gains of women who went on strikes hundreds of years ago are being lost, taken away. An end to racist and sexist assaults everywhere. Protection and expansion of social and public systems that we have. The Women’s March saw thousands of pledges around the world, and NWL saw it as a success of expression of solidarity across the world, saying we stand, 7,000 strong. 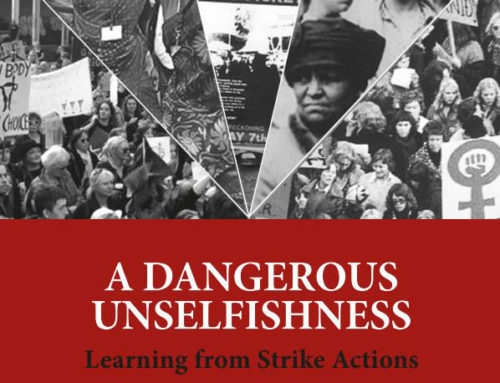 NWL has described it as a ‘mass consciousness raising’ that ensures we are all confronted with the issues, especially through the motivations for striking that women shared. Paulina said that in surveying the strike, they found realisations from participants of their unpaid care work as labour.